I often felt different as one of three Jewish students in my grade. I was disengaged as a reader throughout most of elementary school. I remember our school’s librarian preparing us for an author visit sometime in third or fourth grade. She introduced us to one of Barbara Cohen’s books in advance of her visit by reading one of them — The Carp in the Bathtub — during library class. I adored The Carp in the Bathtub despite the fact that my parents bought our Passover gefilte fish at the store rather than making it from scratch, with a live fish. I’ve come to realize why The Carp in the Bathtub meant so much to me as a young child and remains one of the few picture books I remember from school. That book represents one of the only times I ever heard or read about a Jewish family in a book in elementary school. Back in November, I presented with Melanie Meehan and Meg Kearney at NCTE in Houston where we gave a presentation called “Honor, Reflect, and Celebrate the Diversity of Your Classroom with Mentor Texts.” We grounded the presentation by getting everyone on the same page about mentor texts and reading like a writer. Then, we shifted into sharing book titles with teachers and took the time to highlight how these books could be used not only to build cultural awareness, but also to lift the level of the teaching of writing. So, before I share a book list with you, let’s make sure everyone is going into this together. During our presentation, Melanie shared some questions that were inspired by and adapted from Social Justice Books to help teachers think about cultural awareness when selecting picture books to share with kids in writing workshop. How can books serve as mirrors, windows, or sliding doors into the lives of different people? How many books about people of color, cultures, and lifestyles do you see? Whose stories are included, and whose stories are left out? How many books by people of color, cultures, and lifestyles do you see? How do these books reflect the diversity that exists not only in your school and community, but also in the world? Are people of color engaged in a range of activities and in contemporary settings? Do the biographies on your shelves represent many different people of various colors, cultures, and lifestyles? All students deserve to read mirror books, in which they seem themselves, and window books, in which they learn about others (Bishop, 1990). This means teachers must have books that represent a variety of religions, races, and sexual orientations in mentor-text baskets during all months of the year, not just in those with special designations such as Black History Month or Women’s History Month (2016, 5). Narrative Texts — These are a handful of the many recently-published picture books we love. Our presentation was 75 minutes long, which is why we limited the list of narrative texts to just four. Opinion Texts — Again, the inclusiveness in these texts comes mostly from the illustrations. While this may seem superficial, it matters. As I mentioned in the opening of this post, while the family in The Carp in the Bathtub was engaged in something vastly different to prepare for Passover than my family, it meant a lot to me to see Jewish kids on the pages of a book for the first time. One of the questions on Melanie’s list has to do with a variety of people engaged in every day activities, and that’s exactly what’s going on in these books. If you search past blog posts I’ve written about picture books and mentor texts, you’ll find additional titles. (A new book, Under My Hijab by Hena Khan and Aaliya Jaleel, arrived at my house this past weekend. 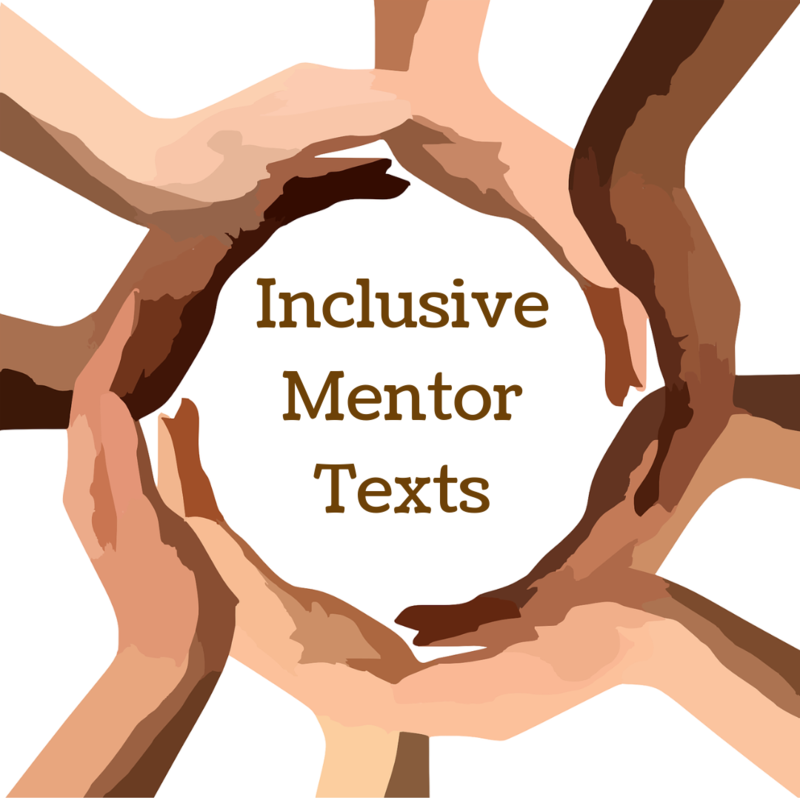 Therefore, I foresee myself writing another post about recently-released, inclusive mentor texts in the near future.) The titles I’ve listed represent the books we shared during our NCTE presentation. My children are growing up in a world where they regularly see themselves on the pages of picture books. While there are niche publishers, like Kar-Ben Publishing, that publish Jewish texts, many mainstream publishing houses publish books about Jewish experiences. I am thankful my children have access to numerous texts in which they will see themselves as they grow as readers. However, my kids read books about children from all ethnicities, family structures, and cultural backgrounds so they can imagine experiences that are different from their own. My second-grade daughter understands that some women wear hijabs, some families have two dads, and some kids use wheelchairs to get around. It is my hope that as my daughter (and my two-year-old son!) grows up, she’ll come to understand that our differences make life richer and more interesting. Whether they’re my children or a group of children I’m working with when I consult in a school, I make deliberate efforts to share current, inclusive books. This is something all of us must do, regardless of where we teach. We can have a positive impact on children’s reading lives when we attempt to make sure every child’s life is reflected in books AND that every child can understand the experiences of other people by reading books. By doing this, we not only positively impact our students, but we improve our society as a whole. In the spirit of the idea of “if we know better, we do better,” I’m providing you with ways to make the books in your classroom more inclusive. Here are resources you can consult if you want to get started with this tomorrow. Reading Communities like It’s Monday! What Are You Reading? and the Nerdy Book Club. Please join us on Monday night! As we move into our opinion writing unit, this was very helpful information. Your blogs have helped me feel much more comfortable with teaching writing. Thanks for the feedback. That’s what we strive for here at TWT, Mary. Thank you Stacey (and your whole team) for engaging in this very important but difficult conversation. Hopefully with more people aware and involved, the topic will become less “hot” and more comfortable. Love the book titles and links to more research on the topics. I’ve been enjoying following these posts, but I am in a bit of a conundrum. I work in a district that has had some very racially driven intense moments at the high school in the last few years (this is an extremely broad summary to keep this comment short). Most recently, the school tried to do a school wide activity to celebrate Martin Luther King Jr and discuss the importance of being kind. The activity did not go well for a lot of teachers and there was a lot of backlash from students (again broad summary). I try to stock a range of books in my classroom for the exact same reasons mentioned in this post. But I just don’t know what to do about the school wide issues. Thanks for writing this series of blogs. It’s always going to be an important issue. 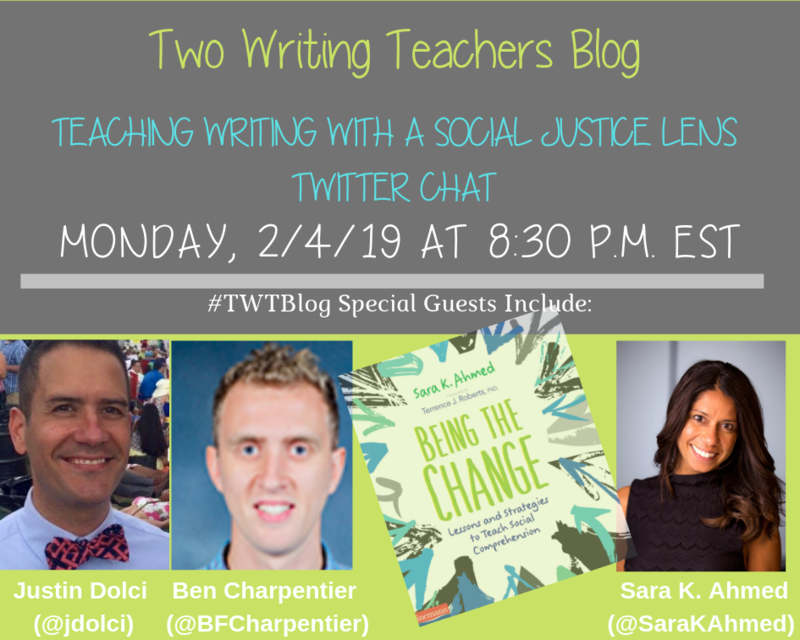 Please join us for Monday’s Twitter Chat. I’d love to hear you pose this to the group. What is the hashtag or name of the chat? Thank you for the ideas. My goal this year was to expand my personal library with many books for diverse writers fills with multicultural voices. I have yet to divide them into mentors yet, that’s my next plan. Maybe when we think of persuasion as opinion and social justice messages as persuasion in our thinking of so what, now what in our writing, we can expand our opinion mentor thinking. Your blog is so helpful to creating a classroom library that is a living part of the classroom. What a great list of resources! I am now rethinking some of my mentor texts and recommending others as read alouds. I love The Way to School by Rosemary McCarney as an inspiring informational text. This post really highlights the need for more diverse opinion picture books! As always, thanks for an awesome post highlighting quality mentor texts. I would LOVE to see more opinion picture books that go beyond being inclusive because of the illustrations alone. It’s a real need. Thanks for the follow-up reads. When I read “Invisible Boy” and one of my students grinned from ear to ear when I mentioned “bulgogi” and shouted out, “Hey that’s Korean!”, there’s a connection to books… an identification to texts/words. It’s powerful and should happen every time we read. That’s a fantastic book. Thanks for mentioning it here. Really appreciating this series Stacey. Thank you for the titles and the links for further learning. Thank you so much for your mentor text suggestions. We have been making an effort this year to incorporate books that serve as both windows and mirrors to our students. I work in a fairly diverse school and we believe that all children need to not only be built up by reading about others who have similar experiences but to build empathy and acceptance for those who have differing experiences. There is so much to celebrate by what everyone brings to the table! My coteacher and I talked with each family before school started and asked which of their identities we might reflect in our classroom library. We learned many things about who are families are, and also learned which families needed more discussions about race and culture and diversity. (E.g. We’re just a normal family.) We also sorted through books to remove any unremarkable fiction books with white/animal main characters. What’s left is a beautifully diverse library that reflects every family in our class – Black cowboys, two moms, activism, Haitian stories, etc., and a ton of nonfiction. You’re doing incredible work, Rasha. Thank you for sharing what you do to make sure everyone is represented in the books you and your co-teacher read! Thank you for starting an important conversation! I so appreciate the resources too! Thank you for the mentor text suggestions, I’m planning on adding several to my classroom collection. I agree with the importance of having students read both about children like them and about the experiences of children not like them. Thank you for the amazing resources! Every child should have the opportunity to see themselves in books.